Hydroxychloroquine is usually taken with food or milk to prevent stomach upset. The dosage and length of treatment are based on your medical condition and response to therapy. In children, dosage is also based on weight. For malaria prevention, take this medication by mouth once a week on the same day of the week, or as directed by your doctor. Mark a calendar to help you remember. This drug is usually started 2 weeks before entering the area with malaria. Take it once weekly while in the area, and continue taking it for 4 to 8 weeks after leaving the area or as directed by your doctor. To treat malaria, follow your doctor's instructions. If you are also taking a certain drug for diarrhea (kaolin) or taking antacids (such as magnesium/aluminum hydroxide), take hydroxychloroquine at least 4 hours before or after these products. These products may bind with hydroxychloroquine, preventing your body from fully absorbing it. Inform your doctor if your condition persists or worsens. It may take several weeks or months to see improvement if you are taking this for lupus or arthritis. Hydroxychloroquine may not prevent malaria in all cases. If you experience fever or other symptoms of illness, seek immediate medical attention. You may need a different medication. Avoid exposure to mosquitoes. (See also Notes section. What conditions does Plaquenil treat? Tell your doctor right away if you have any serious side effects, including: arm/leg/back pain, slow/fast/irregular heartbeat, hair loss/color change, mental/mood changes (e.g., anxiety, depression, rare thoughts of suicide, hallucinations), ringing in the ears/hearing loss, worsening of skin conditions (e.g., psoriasis), severe stomach/abdominal pain, severe nausea/vomiting, easy bleeding/bruising, signs of infection (e.g., fever, persistent sore throat), shortness of breath, swelling ankles/feet, sudden unexplained weight gain, extreme tiredness, dark urine, yellowing eyes/skin. This medication may rarely cause low blood sugar (hypoglycemia). Tell your doctor right away if you develop symptoms of low blood sugar, such as sudden sweating, shaking, fast heartbeat, hunger, blurred vision, dizziness, or tingling hands/feet. If you have diabetes, be sure to check your blood sugars regularly. Your doctor may need to adjust your diabetes medication. This medication may rarely cause serious (sometimes permanent) eye problems or muscle/nerve damage, especially if you take it for a long time. Get medical help right away if you have any very serious side effects, including: sensitivity to light, vision changes (e.g., blurred vision, seeing light flashes/streaks/halos, missing/blacked-out areas of vision), muscle weakness, numbness/tingling/pain of the arms/legs. Get medical help right away if you have any very serious side effects, including: chest pain, fainting, seizures. List Plaquenil side effects by likelihood and severity. Before taking hydroxychloroquine, tell your doctor or pharmacist if you are allergic to it; or to other aminoquinolines (e.g., chloroquine); or if you have any other allergies. This product may contain inactive ingredients, which can cause allergic reactions or other problems. Talk to your pharmacist for more details. This medication should not be used if you have certain medical conditions. Before using this medicine, consult your doctor or pharmacist if you have: certain eye problems (retinal or visual field problems from other aminoquinolines such as chloroquine, macular disease). Before using this medication, tell your doctor or pharmacist your medical history, especially of: alcohol dependency, certain blood disorder (porphyria), certain genetic problem (G-6-PD deficiency), diabetes, kidney disease, liver disease, certain skin problems (e.g., atopic dermatitis, psoriasis). This drug may make you dizzy. Alcohol or marijuana can make you more dizzy. Do not drive, use machinery, or do anything that needs alertness until you can do it safely. Avoid alcoholic beverages. Talk to your doctor if you are using marijuana. Alcohol can also increase your risk of liver problems while you are taking this drug. Caution is advised when using this drug in children because they may be more sensitive to the side effects of the drug. This medication is not recommended for long-term use in children. If a child accidentally takes this medication, even a small amount can be very harmful (possibly fatal). Be sure to keep this drug out of the reach of children. This medication should be used only when clearly needed during pregnancy. This medication is not recommended for use in treating rheumatoid arthritis during pregnancy. Discuss the risks and benefits with your doctor. What should I know regarding pregnancy, nursing and administering Plaquenil to children or the elderly? Some products that may interact with this drug include: ampicillin, cimetidine, digoxin, penicillamine, drugs that may be harmful to your liver (e.g., high doses of acetaminophen, isoniazid). Check the labels on all your medicines because they may contain acetaminophen. Ask your pharmacist about the safe use of those products. 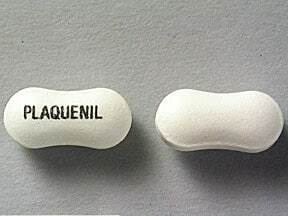 Does Plaquenil interact with other medications? If used for prolonged periods, laboratory and/or medical tests (e.g., liver function tests, eye exams, complete blood count) may be performed periodically to monitor your progress or check for side effects. Consult your doctor for more details. When traveling in an area at risk for malaria, use protective clothing, insect repellent, and bed nets. Remain indoors or in well-screened areas when possible. If you are taking this medication to prevent or treat malaria, use it for your current travel or condition only. Do not use it later to prevent or treat another infection unless told to do so by your doctor. A different medication may be necessary in those cases. Store at room temperature up to 86 degrees F (30 degrees C) away from moisture and light. Do not store in the bathroom. Children are very sensitive to the effects of this medication. It is important to keep this and all medications out of the reach of children and pets. This medicine is a white, dog-bone, film-coated, tablet imprinted with "PLAQUENIL". Are you considering switching to Plaquenil? How long have you been taking Plaquenil?